A new art gallery in Madrid, ArtePaso ShowRoom, has opened with an exhibition of work by Andy Warhol and Pietro Psaier - "The Factory, Andy Warhol & Pietro Psaier.” Claims made about Pietro Psaier over the past few years include that he and Warhol produced "joint works" and that they had a "bisexual relationship" during the 60s. If the "joint works" claimed to be by Psaier and Warhol are authentic, the ramifications for the Warhol market (and therefore, the art market, given the "blue-chip" status of Warhol's work) would be immense. The claims made about Psaier, however, were largely dismissed when Wikipedia removed Psaier's biography from their site because there was no hard evidence that Psaier ever existed, let alone worked with Warhol. Details of the exhibition in Madrid here. Photographer/artist Billy Name - the designer and de facto foreman of Andy Warhol's silver Factory - will be speaking at the Center for the Arts and Humanities at Nassau Community College on Thursday May 6, 2010 from 4:00-5:15 pm (Room GC-65 (basement of the G-Building). The lecture is open to the public. The Nassau Community College is located at 361 Rice Circle, Garden City, NY, telephone: 516-572-8002. Billy previously lectured at the New Paltz State University of New York on Thursday April 29th in conjunction with their "Andy Warhol: Public and Private" exhibition. Details of Billy's upcoming talk can be found here. 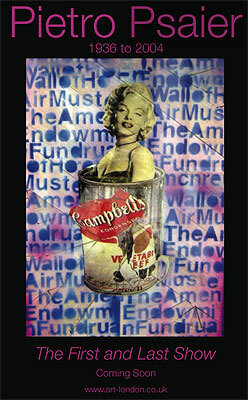 Team Warhol asks: "What are you afraid of?" The students of the University of Maryland's "Philosophy 3245" class (aka "Team Warhol") have posted a film to YouTube asking "What are you afraid of?" Click on the above image. In August 2008, prior to a major auction of work by "Psaier" at his auction house, John Nicholson promised (along with researcher Jacqueline Chapman) to "publish the catalogue raisonné" of Psaier's work. It is now more than a year later and still no catalogue raisonné is forthcoming. See Antiques Trade Gazette here. Although Jacqueline Chapman claims to have a death certificate for the artist she has so far failed to produce one. Nor has anyone explained why the paintings are being sold in the U.K. and Spain rather than the U.S. and why they were not sold before Warhol's death. 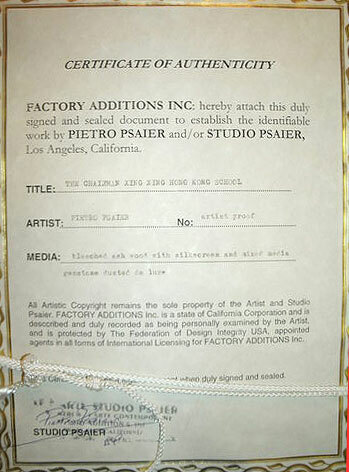 The biography of "Pietro Psaier" was removed from Wikipedia after a week of debate in which nobody was able to come up with any hard evidence that the artist actually existed, let alone collaborated with Warhol. (Wiki articles for deletion here. Despite the doubts about Psaier his works continue to be sold by auction houses in the U.K. A collector has left a comment on the Psaier page of the about.com website indicating that works alleged to be by Psaier were sold at both Southgate and Criterion Auctions in addition to Nicholsons. The Coloured Rain Gallery in Northern Ireland has also sold quite a number of "Psaiers." Chiswick Auctions have sold his works in the past and currently have a Psaier painting titled "Cocaine" in their catalogue. Keys Auctions in Norfolk are offering two works attributed to "after Pietro Psaier" in their 7 May 2010 prints sale. Strangely, even though they are attributed as "after Pietro Psaier" the description mentions that they bear a signature. (See Invaluable catalog here. Other Psaiers being sold in future auctions include two attributed to "Studio Psaier" by Lots Road Auctions in Chelsea scheduled for their 9 May 2010 auction. Lots Road has sold Psaiers in the past. They list one sold for £600 in a previous sale on 25 April 2010. This is in addition to the hundreds of works offered for sale by John Nicholson in several high profile auctions of Psaier's work - despite the fact that "The First and Last Show" of Psaier's work was announced as early as winter 2007 by Art in London magazine. Mary Woronov - who starred in numerous Warhol films (including The Chelsea Girls and Hedy) as well as performing with the Velvet Underground as part of the Exploding Plastic Inevitable - will be participating in the "Tribute to Roger and Julie Corman" taking place this weekend, April 23 - 25, 2010, at the University of Southern California (USC) in Los Angeles. Mary will be introducing a screening of Rock n' Roll High School on Saturday, April 24, 2010 at 2:00 pm and she'll also be one of the panelists at "The Legacy of Roger & Julie Corman" event beginning at 6:00 pm on Sunday, April 25th. Two Corman classics starring Woronov, Rock 'n' Roll High School and Death Race 2000, are being released in Blu-ray in May and June. A documentary on Mary is currently in production and is due to be released in 2011. Her latest film, The House of the Devil, has also beeen released on both Blu-ray and standard DVD. 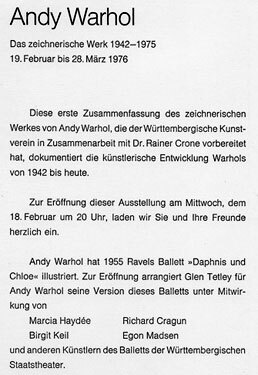 For decades now, art writers have been using the incorrect starting date for the exhibition "Andy Warhol: Das zeichnerische Werk" - a major show organized by Rainer Crone which traveled to Dusseldorf, Bremen, Munich, Berlin, Vienna and Lucerne. Although most (if not all) exhibition lists and chronologies indicate a starting date of February 12, 1976 the exhibition actually opened a week later - on February 19, 1976, as per the announcement for the show (above) as brought to my attention by a site-user. Presumably one author listed it incorrectly and the wrong date was picked up by later publications - another case of "Chinese whispers" in the art world (similar to the often repeated but incorrect attribution of the term "pop art" to Lawrence Alloway - see "Danto also makes a critical error.. here."). The site-user who brought it to my attention has had the correct date (February 19) confirmed by the museum. 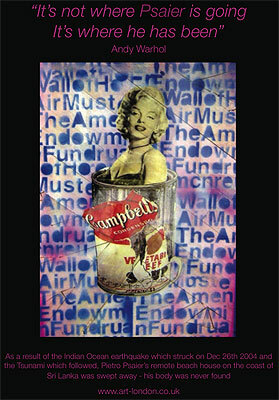 "Twisted Pair: Marcel Duchamp/Andy Warhol," an exhibition exploring the artistic links between Andy Warhol and Marcel Duchamp opens at The Warhol museum on May 23, 2010. Warhol made several short films of Duchamp and at one point planned on filming him over a 24 hour period. Warhol's sculpture The Large Kiss was most likely a reference to Duchamp's Large Glass and his Most Wanted Men series a reference to Duchamp's Wanted: $2,000. Just as Duchamp "retired" from painting in the 1920s, Warhol announced his retirement from painting during a trip to Paris in 1965 - although neither actually stopped producing work. On May 18th Callie Angell, Adjunct Curator of the Andy Warhol Film Project at the Whitney Museum of American Art (and author of Andy Warhol Screen Tests: The Films of Andy Warhol Catalogue Raisonné, Vol. One) will be giving an illustrated talk on Warhol's unfinished and unreleased film Batman Dracula at the Light Industry at 177 Livingston Street, Brooklyn. Tickets available at the door for $7/Starts at 7:30 pm. Robert Patrick's illustrated lecture on the Caffe Cino is now available on DVD and can be ordered at: here. 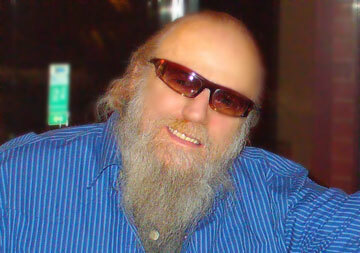 Robert was one of of the playwrights at the Cino and maintains an online archive of photos and materials relating to the venue here. In addition to his work on the Cino, he is currently working on "Nameless Neighbors" - a collection of haunting photographs of the forgotten homeless people of Hollywood where he currently lives. Robert can also be seen in the documentary on Quentin Crisp, Resident Alien. A YouTube clip from the film (which also includes footage of Holly Woodlawn) can be seen here.